For a number of seasons now, the Metropolitan and Central have been the better and deeper of the NHL’s four divisions. That has meant teams from the Atlantic and Pacific have been picking higher in the entry draft in recent years. Is that balance of power on the verge of shifting this season? According to my annual preseason predictions, the answer is yes — at least to some degree. Some of these predictions — from the divisional standings to the playoff picture to the draft lottery odds — are, admittedly, aggressive in nature. Perhaps that is the Vegas effect or the fact that parity is alive and well in the NHL, with plenty of playoff turnover and standings shuffling from one season to the next. 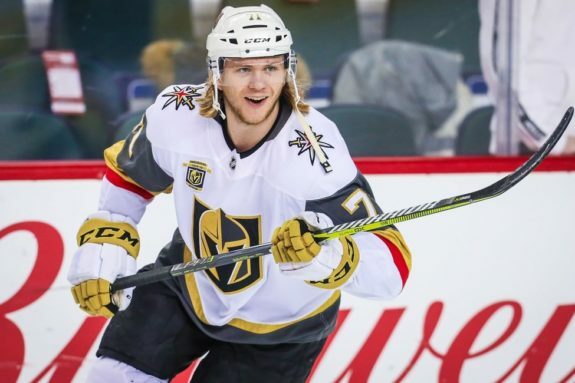 William Karlsson and the Vegas Golden Knights exceeded all expectations last season while completely ruining everyone’s predictions. Now the slate is wiped clean and we’re starting from scratch again. With the exception of a handful of teams, it’s safe to assume 25-plus owners and general managers are entering this season with the expectation of making the playoffs or believing in that potential. Heck, that number could be as high as 31. Again, Vegas proved anything is possible by advancing to the Stanley Cup Final as an expansion franchise. Granted, that was a remarkable run of Leicester-level improbability, but it will be difficult to dispute any predictions from this day forward. For the record, my preseason predictions from last year had the Golden Misfits bringing up the rear in the Pacific, not only missing the playoffs but finishing dead last with the highest odds of winning the Rasmus Dahlin lottery. Boy, was I ever wrong about those Golden Knights, but so was everybody else who posted their predictions prior to last season. I can’t recall a single published prediction of Vegas making the playoffs in its inaugural campaign. Come to think of it, my mind is also drawing blanks on any published predictions from last fall in favour of Colorado or New Jersey making the playoffs? Feel free to enlighten me, but they were few and far between to be certain. Most had all three of those clubs in the lottery mix based on my memory. Yes, including yours truly. Taylor Hall and the New Jersey Devils surprised the hockey world by making the playoffs last season. Hall was so dominant in the second half that he went on to win the Hart Trophy as the NHL’s most valuable player. Counting Vegas, there were seven different playoff teams in 2018 from 2017. That’s almost half — 7 of 16! That included Winnipeg, Colorado, Vegas and Los Angeles in the West, replacing Chicago, St. Louis, Edmonton and Calgary. In the East, Tampa Bay, Philadelphia and New Jersey bumped out Ottawa, Montreal and the New York Rangers. Crazy, what a difference a year makes nowadays. Sure, that was a crazy year and may have been more turnover than usual, but I believe it’s going to become the new norm thanks to that aforementioned league-wide parity. In fact, I’m feeling a tad conservative in predicting “only” six different playoff teams in 2019 from 2018. Set the over/under at five and I’m totally taking the over. Tempting as it is to reveal that list right here and right now, I’ll hold off on the spoilers and make you read on. But apologies in advance to the 15 fan bases of teams that didn’t make my playoff picture, especially the six that fell out from last season since they’ll be the most enraged. Tampa Bay wins in 6. ANALYSIS: Erik Karlsson was going to put some team over the top and now we know it’s the Sharks, who missed on John Tavares but might have netted the offseason’s biggest fish without surrendering a significant piece from their current roster. Bravo, Doug Wilson. San Jose now boasts the league’s best defence, a sneaky deep offence with more young weapons emerging, and an efficient if not spectacular starting goaltender. On paper, the Sharks suddenly look like the team to beat not only in the Pacific but in the entire Western Conference. ANALYSIS: Vegas dropped a spot from my offseason predictions despite landing Max Pacioretty in another late-summer blockbuster. Losing Nate Schmidt for a quarter of the season because of a bizarre (bogus?) “doping” suspension will impact the Golden Knights and most expect their shine to wear off a bit from last season. As somebody who bet against them all season and again through three rounds of the playoffs, I’ve become a believer in Vegas. Finally. Better late than never, but I believe the additions of Pacioretty and his new set-up man that was lacking in Montreal, Paul Stastny, will pay dividends and keep the Golden Knights in the playoff picture while ensuring they still start the postseason with home-ice advantage. ANALYSIS: Nothing is assured from here down in the Pacific. The top two seeds are locked in, with some separation from the pack in my opinion, but these next four or even five teams — if you’re inclined to include Arizona — are quite interchangeable and a case can be made for each as a playoff contender. Certainly the two from Alberta and the other two from California project to be in that mix. My order might seem a bit backwards, or reversed from the majority, but I’m higher than most on Edmonton as a bounce-back team. As long as Connor McDavid is healthy, Cam Talbot isn’t terrible, and the special teams improve to league average (or better), the Oilers are going to get in. If the power play can make opponents pay for trying to slow down McDavid, Edmonton could become that team nobody wants to face in the first round. ANALYSIS: The Flames have enough firepower and forward depth to be a playoff team, no doubt about that. They will miss Dougie Hamilton’s offence on defence, but their top four on the back end remain solid with Noah Hanifin as his replacement. Goaltending is the real key, the real question mark for Calgary. Mike Smith is 36 years old and injury prone, while David Rittich and Jon Gillies are relatively unproven and unreliable backups. If Smith goes down (again), so too could Calgary’s playoff hopes. I mean, the Flames can score, but they aren’t so potent that they’ll be able to outscore the opposition on a nightly basis. A real bubble team and Smith getting hurt (again) would burst that bubble. If Smith stays healthy, I do like Calgary’s chances. ANALYSIS: I flip-flopped these next two California teams a couple times in my head in the lead-up to these predictions, and it’s easy enough to envision either — or perhaps even both — in the playoffs again. With a healthy Jeff Carter, the addition of Ilya Kovalchuk and a full season of Dion Phaneuf, theoretically the Kings should be better than last season. That’s entirely possible, but I still feel like a lot went right for Los Angeles last year — at least in the regular season. The Kings are stacked on defence, there is no disputing that, but they are top heavy at forward with a weak bottom six and Jonathan Quick’s groin has endured a lot of wear and tear — hard miles per se — over the years. I also feel the Kings will miss Pierre Turgeon’s influence as their offensive coordinator. I think he had a real impact on last season’s resurgence — for Anze Kopitar, for Dustin Brown, and for the team in general. Kovalchuk seems to be fitting in fine, but this roster is past its prime and Quick’s injury history scares me. A decade ago, even five years ago, these Kings would be contending — but not this season. ANALYSIS: I should know better than to bet against the Ducks — I’ve made that mistake before — but their core keeps getting older and they could be down three of their top-six forwards to start the season, with Corey Perry sidelined at least five months and uncertainty surrounding the status of Ryan Kesler and Patrick Eaves. The long-term loss of Perry is a significant blow, even though he was coming off a bad season by his standards. Perry could have been this year’s Dustin Brown, but he won’t get that opportunity to re-establish himself now that he’s undergone knee surgery. John Gibson and Anaheim’s top four on defence should do their part to keep the Ducks in the playoff race, and I’m intrigued to see how Troy Terry, Sam Steel and Max Comtois can fill in for Perry, Kesler and Eaves if need be. It could be a transitional season of sorts for Anaheim, but when it came down to finalizing my playoff picture, the Ducks didn’t make the cut. ANALYSIS: Arizona should be a team on the rise and sure looked like one in the second half of last season. But those were meaningless, pressure-less games and it will be interesting to see if the Coyotes can pick up where they left off. Whether Antti Raanta can resume that second-half Vezina form and whether the team took off after adjusting to Rick Tocchet’s systems, or whether they were simply playing looser and succeeding with nothing at stake. If healthy to start this season, I really believe the Coyotes would have been a popular playoff pick. I certainly wouldn’t have ruled them out. But with Alex Galchenyuk and Christian Dvorak sidelined and Dylan Strome also banged up in the preseason, it’s tougher to take that leap of faith. A strong start, getting out of the gate on a winning note and building momentum was always going to be key for Arizona this season, but those injuries are making for an uphill battle from the outset again. I’m not saying it’s impossible for the Coyotes to make the playoffs — nothing is impossible in this new NHL — but I wouldn’t bet on them as of today. ANALYSIS: The future is looking bright for Vancouver, but the present is looking bleak. That’s not necessarily a bad thing, with the potential to reunite the Hughes brothers next season. Imagine a top power-play unit consisting of Jack and Quinn Hughes with Brock Boeser, Elias Pettersson and Bo Horvat. That is the hope of many Canucks’ fans, with Jack pegged as the top prize in the 2019 NHL draft, which just happens to be taking place in Vancouver. Pettersson looked like the real deal in the preseason and the stars could be aligning for the Canucks, but their rebuild remains a work in progress and ownership probably should have listened to Trevor Linden on that front rather than signing the likes of Jay Beagle, Antoine Roussel and Tim Schaller to peculiar contracts. Have patience Mr. Aquilini — with this young core and with Travis Green as coach — and Vancouver should be rewarded with a contending team again in due time. ANALYSIS: Winnipeg lost more than it added in the offseason, but the Jets will continue to reap the benefits of their strong drafting and development. Expectations are now much higher after making the playoffs and going on a run to the Western Conference final, but the Jets won’t be going away any time soon. They are built to win for the foreseeable future and that playoff experience will prove invaluable for their budding young stars — be it Patrik Laine or Connor Hellebuyck, Kyle Connor or Josh Morrissey. There is another wave of talent coming too, with Jack Roslovic, Kristian Vesalainen and Sami Niku looking primed to become regulars — if not impact players — this season. Winnipeg could become a fixture in the final four, as long as Hellebuyck stays healthy. ANALYSIS: Nashville will be determined to get back at Winnipeg this season and many see this division as a two-horse race. Some still have the Predators leading the Central pack, but most agree that another second-round showdown is imminent. Fast forward through 82 games and the first round, right? Well, you never know, but the Predators shouldn’t take a step back. Not after returning their entire core, locking up Ryan Ellis in the process, and bringing back Dan Hamhuis to round out the blue line. A full season of Ryan Hartman and Eeli Tolvanen should help ensure Nashville remains a legitimate Cup contender — and a real threat to the Jets. ANALYSIS: Speaking of threats, don’t sleep on St. Louis this season. Doug Armstrong reloaded the Blues in the offseason — signing David Perron, Tyler Bozak and Patrick Maroon as free agents, and acquiring Ryan O’Reilly from Buffalo. St. Louis, like Winnipeg, is also going to work in some top prospects thanks to superior drafting — especially in Ontario — so the Blues could be one of the teams fortunate enough to ice four scoring lines this season. The league is going to trend that way — with possession such a key component, there soon won’t be a place for checking lines and so-called shutdown forwards, only for attackers — and the Blues appear to be ahead of the curve in that regard. Credit Mike Yeo for seemingly embracing that approach and expect St. Louis to reap those rewards. The Blues are solid on defence too, with goaltending the only potential concern, but if Jake Allen doesn’t step up, Ville Husso is waiting in the wings and could steal the crease sooner than later. Regardless of who’s between the pipes, St. Louis should make a triumphant return to the playoffs and the Blues might even spoil that aforementioned second-round showdown that everybody is anticipating. ANALYSIS: I’m not as confident about Dallas returning to the playoffs as I am St. Louis, but the Stars will definitely be in the race this season. Nothing against Ken Hitchcock, who will probably go down as a Hall-of-Fame coach and an innovator in his own right, but Jim Montgomery will bring a fresh approach to Dallas. The new bench boss will benefit from the return of Valeri Nichushkin and the arrival of Miro Heiskanen, giving the Stars two more weapons in an already potent attack. If Jason Spezza, Mattias Janmark and eventually Martin Hanzal are all healthy, along with Marc Methot on defence, that makes Dallas much more formidable. Ben Bishop has to stay healthy too, but the Stars appear to be in really good — dare I say great? — shape on paper. This is another team that — if it gets in — could make some noise in the playoffs and be a tough out. ANALYSIS: Colorado isn’t a one-year wonder. I don’t feel that way at all, so don’t get me wrong. The Avs are a team on the rise, albeit a team that might have been a bit ahead of its time last season in going from a distant last-place finish two years ago to a playoff berth. I think even the biggest Avalanche supporters would admit that they will be hard-pressed to make it again, especially after seeing the improvements made by St. Louis and Dallas in the offseason. Nathan MacKinnon is a very driven individual, so don’t expect any such admission from him. The young core that is leading the Avs will be doing everything in their power to prove last season was no fluke and rather a sign of things to come. I do think some of Colorado’s sophomores — such as Tyson Jost and Samuel Girard — could take another big step in their development, which might be enough to keep the Avs in the playoff picture. The goaltending could also become a strength, with Philipp Grubauer brought in to platoon with Semyon Varlamov, but top to bottom I just don’t think Colorado stacks up with Dallas or Calgary, for that matter, when it came to deciding on my wild-card teams. I have the Avs falling just short. ANALYSIS: Minnesota has never really impressed me — the Wild are a very “meh” team on paper, in my opinion — but Bruce Boudreau’s clubs always seem to find a formula for regular-season success. So I probably shouldn’t be counting out the Wild or writing them off the way I’m about to. As long as Boudreau is coaching, Minnesota could remain in the playoff mix, but I’m quite convinced the Wild will be trending down this season — perhaps plummeting hard and fast, as evidenced by my draft lottery order. My reasoning is three-fold. First off, I don’t think Ryan Suter will be the same player coming off a busted ankle, certainly not the same all-situations workhorse. Secondly, I think Eric Staal and Mikko Koivu will start showing their age and really slowing down this season. And last but not least, I think Devan Dubnyk’s days as a top-10 goalie or even a top-20 goalie are numbered. I don’t think we’ll hear his name in any Vezina conversations this season — especially if Suter loses a step in front of him. Add it up and Minnesota gets a top-10 pick in 2019. It would also add up to a new coach for the Wild, with new GM Paul Fenton getting to pick his man — perhaps midseason. Fenton didn’t do much tweaking in his first offseason with Minnesota and didn’t touch the existing core, but he’ll have his work cut out for him going forward there. Fenton should also be going to Russia with a blank cheque for Kirill Kaprizov ahead of next season. ANALYSIS: Who lasts longer this season, Boudreau or Joel Quenneville? Two of the league’s longest standing and most respected coaches are on the hot seat and either of them could be the first to get fired. Quenneville is in a real tough spot with Chicago, especially if his fate rests in the hands of Cam Ward. With Corey Crawford still working his way back from post-concussion symptoms and vertigo, the Blackhawks’ goaltending situation doesn’t bode well for Quenneville’s job security. Crawford has the skill to save the day, but his return date is still to be determined and there is sure to be a rust factor there too. Reality is, Chicago’s dynasty days are over and the Blackhawks are in the midst of a retool, which will likely result in a new face behind the bench at some point within the next year — if not midseason. There is still enough talent on this roster to make a push for the playoffs, if Crawford gets healthy and returns to form sooner than later, but it’s only a matter of time until Stan Bowman has to consider blowing it up and going full rebuild. Whether than means moving Jonathan Toews or Patrick Kane, Duncan Keith or Brent Seabrook, we might get that answer this season. To me, a trade or trades involving one or more of those big four seems more likely than a return to the postseason in 2019. ANALYSIS: Steve Yzerman is no longer manning this ship, but he stepped aside after putting all the pieces in place for another deep playoff run and potential championship. Tampa Bay is in great shape on paper and there is still continuity throughout the organization, with Julien BriseBois promoted to general manager and Jon Cooper returning as head coach. The foundation is there, with Steven Stamkos as captain, Victor Hedman anchoring the blue line, and Andrei Vasilevskiy tending the net. The Lightning are deep up front and also on the back end. Not much more needs to be said, since anybody who follows hockey already knows that Tampa Bay projects as one of the true contenders this season. That window to win isn’t closing by any means, but the quality of competition in the Atlantic is getting tougher with every passing year, so the Lightning will need to go all-in again in order to come out of their division and in hopes of going all the way in 2019. ANALYSIS: John Tavares’ homecoming has made Toronto the betting favourite, so managing those expectations in the centre of the hockey universe will be Mike Babcock’s biggest challenge this season. The parade route is already planned, even though the young Maple Leafs’ core has yet to get out of the first round and the defence remains mediocre. But a case can be made for Toronto’s forward group being the league’s best and Frederik Andersen has proven to be a top-10 goaltender capable of handling a heavy workload and high shot volumes. Andersen will see more than his share of rubber again this season, but the Leafs should be able to attack in waves and deploy an entertaining run-and-gun style. In a track meet, not many teams will be able to keep up with Toronto. It’s just a matter of Babcock pressing the right buttons and Kyle Dubas keeping his finger on the button should a defence upgrade become available. The bar is set sky high — rightly or wrongly — and it should be fascinating to watch as these Leafs try to end Toronto’s (and Canada’s) lengthy Cup drought. ANALYSIS: The top three in the Atlantic may seem cemented, but I’m not so certain. I kept Boston as my third seed, but let it be known that the gap between the top two and Boston is bigger in my mind than the gap between Boston and these next two. That’s not to say the Bruins will be a distant third, but I do feel there is a chance that Boston could slip to fourth in the division this season. A slight chance, but a chance nonetheless. In saying that, the Bruins are returning much the same team as last season and some of their young players are primed to take another step — surely guys like Charlie McAvoy and Jake DeBrusk will continue to make a bigger impact. Boston has one of the best top lines in the league with Patrice Bergeron between Brad Marchand and David Pastrnak, and Tuukka Rask showed last season that he’s still an elite netminder. Forward depth is a bit of a concern for Boston in terms of matching up against Tampa Bay or Toronto in a seven-game series, but it shouldn’t hold the Bruins back from making another playoff appearance. ANALYSIS: Aleksander Barkov has taken over as Florida’s captain and should be able to lead the Panthers into the postseason after falling a single point short of the playoffs in 2018. Florida came that close despite a slow start under new bench boss Bob Boughner before coming on strong in the second half. The Panthers were also missing Roberto Luongo for long stretches due to injury, and they have since added Mike Hoffman as an another scorer to solidify their top-six forwards. The defence remains intact for Florida as a position of strength, but this season probably still hinges on Luongo’s health to some degree. Not that James Reimer and Michael Hutchinson couldn’t hold the fort, but even at 39 years old Luongo is capable of stealing games and every point will be important again for the Panthers’ playoff chances. On paper, Florida is a playoff team in my opinion and — with a better start this season — could challenge Boston for that third seed in the Atlantic. ANALYSIS: Last season, I lived and died with the Sabres as a playoff team. This season, despite not loving or even liking their goaltending, I’m going to gamble on them again. Buffalo over Columbus is as bold as it gets for my predictions this year, and maybe I should have learned my lesson from last year, but I really like this Sabres’ roster aside from the goaltending. I totally think Buffalo is going to be this year’s Colorado — almost a mirror image in terms of turnaround, from last-place overall to a wild-card berth. Jack Eichel will break out much the same as MacKinnon did, flanked by Jeff Skinner and Sam Reinhart for a comparably potent top line to the Avs’ trio with Gabriel Landeskog and Mikko Rantanen. I see Rasmus Ristolainen as being similar to Tyson Barrie, and I believe Rasmus Dahlin will make an immediate impact for Buffalo — even more so than Girard did for Colorado. I’m expecting the rest of Buffalo’s defence to rebound and be blessed with better health. Phil Housley and Steve Smith will get more goals out of that group this time around too. Speaking of more scoring, I quite like the Sabres’ forward depth and think young guns like Casey Mittelstadt and Alex Nylander could become serious threats as the season progresses. There’s lots to like in Buffalo, lots of reasons to believe in the Sabres’ playoff potential . . . and then there’s the goaltending tandem of Carter Hutton and Linus Ullmark. If not the league’s worst, it ranks right up there — or rather down there — and could be the demise of an otherwise promising season. Living and dying with Hutton is a risky proposition — for the Sabres and for my predictions — but goaltending be damned, I’m betting on Buffalo again. ANALYSIS: There is a drop-off here for the bottom three teams in the Atlantic, all of whom will be bottom-10 teams in the league according to my draft lottery order. In saying that, Detroit strikes me as a team that could be sneaky good — not playoff good, but competitive most nights and better than many are anticipating. Detroit is rebuilding and undergoing a changing of the guard now that Henrik Zetterberg has retired, leaving only Niklas Kronwall and Jimmy Howard on the active roster from the Red Wings’ contending teams of a decade ago. And those two are likely entering their final season with Detroit — and may be traded as rentals if there are interested buyers at the deadline — so expect a full-on youth movement to play out there. Gustav Nyquist could be done in Detroit too, as another pending free agent in 2019 and prime rental option. Yet, it appears the Red Wings will be fairly deep up front with or without top-10 picks Michael Rasmussen and Filip Zadina in the lineup. The back end is more concerning, with Detroit’s defence hurting to start and thus opening the door for a few rookies on the opening-night roster. Injuries always seem to be an issue for Detroit, so I wouldn’t go as far as to call the Red Wings a sleeper team, but something tells me they won’t be as bad as we (including me) are expecting. But there is no reason to expect octopuses hitting the ice in mid-April. ANALYSIS: Trading Pacioretty wasn’t a surprise but may have been a sign that Marc Bergevin is ready to rebuild in Montreal. Even with Carey Price in net, I don’t see any other option for the Canadiens, who won’t be able to compete in this division any time soon. If Price stays healthy and plays to the best of his ability, the Habs could finish ahead of Detroit, but I don’t see this roster overtaking anybody else in the Atlantic. Certainly not without Shea Weber, who isn’t expected back before Christmas and probably won’t return to form coming off knee surgery and having to get up to speed midseason. The Canadiens are still weak at centre and also on defence without Weber, so there isn’t much hope for Montreal this season. Any and all hope lies on the shoulders of Price and a handful of scoring wingers — some playing out of position as centres — but that is no way to build a team in 2018. Not a playoff team, anyway. ANALYSIS: Where to even start with this mess of a team — mess of an organization, really. It starts at the top with beleaguered owner Eugene Melnyk, who seems to be pulling all the wrong strings on Pierre Dorion. Together, they got a laughable return for their franchise player in Erik Karlsson. This, after packaging their 2019 first-round pick to Colorado for Matt Duchene. The worst-case scenario would see that pick turn into Jack Hughes while Duchene walks away as a free agent just days later. Worst case but also a predictable scenario — to everybody but Dorion, who defiantly held onto his 2018 first-rounder, taking Brady Tkachuk fourth overall and deferring the 2019 pick to Colorado in a decision that has disaster written all over it. Regardless of how that plays out, what’s done is done and Dorion needs to focus on rebuilding the Senators through more trades for futures. That means moving Duchene and Mark Stone ahead of this season’s deadline, maximizing their rental value and recouping at least one 2019 first-rounder. Yes, the Sens are going to get worse — much worse — before they get better. No, there is no hope for Ottawa this season. ANALYSIS: The reigning champs are returning almost their entire roster and the Capitals have always been a good regular-season team. Sure, there could be a Stanley Cup hangover — did you see those keg Cup stands? — and repeating has never been tougher, but it’s hard to bet against Washington topping the Metro standings. The coaching change, with Todd Reirden promoted to take over from Barry Trotz, should be pretty seamless. There is no reason — other than Alex Ovechkin’s hangover — to expect the Capitals to take a step back. As long as Braden Holtby stays healthy, this team should stay in contention for a fourth straight division title and a second consecutive Cup. ANALYSIS: Dethroned by rival Washington after two years on top of the hockey world, Pittsburgh will be determined to get that Cup back. Sidney Crosby is a relentless leader and the extra rest that the Penguins got this offseason should bode well for a resurgence. Matt Murray needs to establish himself as a healthy work-horse in goal, but Pittsburgh is in good shape everywhere else. And Murray is a good goalie, there is no doubt about that. Mike Sullivan and Phil Kessel appear to have patched up their rumoured rift from the playoffs, and Kris Letang is looking like his old self again after being limited by injuries in recent years. Still lots to like in Pittsburgh, with the Penguins still a legitimate Cup contender. Come the playoffs, it’ll be tough to bet against Crosby and Co. again. ANALYSIS: The Flyers still have goaltending concerns, but the return of James van Riemsdyk should help Philadelphia outscore the opposition more often than not. Philadelphia’s forward depth is now among the league’s best, with three potent lines and two loaded power-play units. The defence is decent, with Ivan Provorov trending towards Norris contention and Shayne Gostisbehere an offensive catalyst from the back end. The Flyers need another young guy like Travis Sanheim or Philippe Myers to step up over the course of this season and really solidify their top four for the future — and for a playoff run. But more than anything, Philadelphia needs to get its goaltending figured out. That might mean relying on Carter Hart as a rookie since Brian Elliott and Michal Neuvirth haven’t been the answer to date. Elliott is still the starter as of today, but don’t be surprised if Hart is starting the playoff opener. The Flyers should get in again and could put up a better fight in that Battle of Pennsylvania. ANALYSIS: The Hurricanes have been wrongfully pegged as a breakout team for a few years now, held back by subpar goaltending despite posting some of the league’s better underlying numbers. Rod Brind’Amour has taken over as head coach and will look to push Carolina into the playoffs while maintaining that strong possession game. Adding Dougie Hamilton on defence and inserting Andrei Svechnikov and Martin Necas as talented rookie forwards might be the push that the Hurricanes needed. Those three will certainly move the needle to some degree for Carolina, which boasts one of the league’s better defence corps. However, the goaltending remains a weakness with the tandem of Scott Darling and newcomer Petr Mrazek among the league’s worst. I have Carolina getting edged out by Buffalo for the second wild-card spot in the East, but that was a close call between two teams with suspect goaltending. I do think one of those teams will break through this season and it might be whichever one makes a move to shore up its goaltending. Howard should be available in Detroit, but the big fish in net belongs to this next team. ANALYSIS: This Columbus roster has contender written all over it — arguably a top-10 (top-five?) team on paper across the whole league — but I’m sensing potential disaster. No, it has nothing to do with another Ryan Murray injury — that was to be expected, sadly. The fact Seth Jones will miss at least a month with a sprained knee while Zach Werenski is coming off a shoulder surgery with limited training is much more concerning. But, for me, it’s all about Artemi Panarin and even more importantly Sergei Bobrovsky being in contract years and putting Jarmo Kekalainen in a very difficult spot as the trade deadline approaches, especially with the Blue Jackets being in this daunting division and facing another potential (likely?) first-round exit. Kekalainen can’t afford to get nothing in return for his two best players — not after watching Tavares walk away from the Islanders. That distraction will be looming large — it will be the elephant in the room — for a Columbus team that has been streaky in recent years. Those questions aren’t going to go away and we all know John Tortorella is a strong personality, so this season could go off the rails in a hurry if and when the Blue Jackets start skidding. If Panarin and Bobrovsky were locked up and fully committed, this wouldn’t be a concern and Columbus would be a playoff lock, but I have a feeling both will be gone by the deadline and the Blue Jackets will be fading from relevance as a result. Kekalainen and Tortorella could both be gone following the season too. How’s that for a hot take? Now watch Columbus win the Cup and successfully re-sign both its stars! ANALYSIS: Unlike Colorado, I do think New Jersey was something of a one-year wonder. Taylor Hall is a star, a total stud, and fully deserving of MVP honours for carrying the Devils to the playoffs last season. Can he do it again? I have my doubts. Nico Hischier should help with more of the heavy lifting as a sophomore, but New Jersey isn’t overly deep up front or on the back end. Cory Schneider’s status in goal is also iffy with a wonky hip, and I’m not convinced Keith Kinkaid can backstop the Devils to the postseason again. Looking up and down New Jersey’s roster, I’m left wanting more at every position. I just don’t see a playoff team there. I see a bottom-10 team, but I was wrong about that last season. Maybe the Devils will make me a believer this season. ANALYSIS: No Tavares, no hope of playoffs. The Islanders did nothing to replace their franchise player and despite upgrading the off-ice staff with Trotz coming in as coach and Lou Lamoriello as general manager, this team is in rough shape. Shambles in the present, but there is some promise for the future. Matt Barzal is now the face of this franchise, but he’s going to be facing much tougher assignments as a sophomore since he’s no longer playing in Tavares’ shadow. Barzal will be in tough to match his Calder-winning stat-line, but he’s the least of the Islanders’ worries. Goaltending tops that list, with Robin Lehner brought in to platoon with Thomas Greiss, though neither of them inspire much confidence. Lehner had his struggles on and off the ice in Buffalo, so a change of scenery could be beneficial. Ryan Pulock appears poised for a breakout season as an offensive defenceman, but the good will surely be outweighed by the bad when it comes to an Islanders team lacking forward depth and overall star power. Expect Lamoriello to be a seller, to tear this team down before building it back up. That will likely mean trading Anders Lee, Jordan Eberle and Brock Nelson as pending free agents, stockpiling futures and freeing up cap space to put his own stamp on the Islanders’ roster next summer. Tanking for Jack Hughes in hopes of reuniting him with Oliver Wahlstrom next season might also be part of Lamoriello’s master plan. Trotz may be able to coax a few extra wins out of this mediocre group, but nowhere near enough to get into the playoff mix. ANALYSIS: Jeff Gorton is doing a real nice job of rebuilding the Rangers and that process will continue this season under new coach David Quinn. Youth will be served in New York City, with several rookies cracking the opening-night roster and more to come as the campaign progresses. Mats Zuccarello and Kevin Hayes are pending free agents, so Gorton will probably flip them for more futures at some point unless the Rangers are exceeding all expectations. There aren’t any big names on this roster — besides The King, Henrik Lundqvist in goal — but the Rangers could be a team that scores by committee. Depth isn’t the issue here, it’s more so a lack of high-end talent. The depth, both at forward and on defence, is quite impressive and makes me think the Rangers could take some teams by surprise. The Rangers can play loose, like they have nothing to lose this season, which could make them a dangerous opponent — much like Vegas was last season. But I don’t think that kind of Cinderella run will be in the cards for the Rangers, even if Lundqvist is standing on his head on a nightly basis. Finishing ahead of the Islanders might be a realistic goal for the Rangers, but there is nothing wrong with being a lottery team at this stage of the rebuild. Jack Hughes would be huge for New York City, even if the Rangers don’t really need another centre prospect. There you have it, my fearless and hopefully not fruitless preseason predictions. As mentioned, I’ve got six different playoff teams for 2019 with Edmonton, Calgary, St. Louis, Dallas, Florida and Buffalo replacing Anaheim, Los Angeles, Minnesota, Colorado, Columbus and New Jersey. The biggest surprise is obviously Buffalo in and Columbus out. The rest aren’t overly big reaches, but predicting the Atlantic to claim both wild cards in the Eastern Conference is also going against the grain, with most pundits more inclined to go with two Metropolitan wild cards — as was the case in 2018. 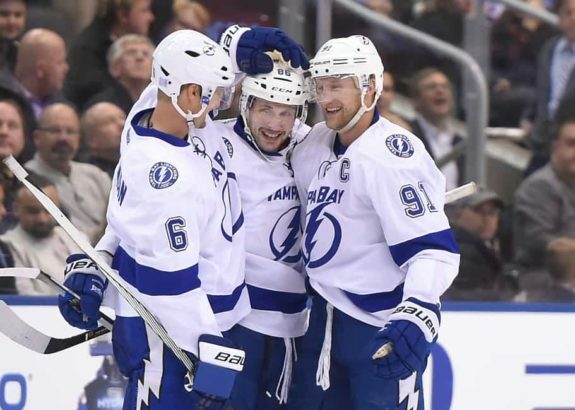 Steven Stamkos, right, Nikita Kucherov, centre, and Anton Stralman remain core players for the Tampa Bay Lightning and could get finally lift the Stanley Cup together after a couple close calls in recent years. I didn’t go very bold with my playoff picture, pitting my top two seeds from the regular season in the Stanley Cup Final with Tampa Bay defeating my Presidents’ Trophy winner in San Jose. That would be a wicked series between two evenly matched teams, but I have the Lightning prevailing over the Sharks in six games thanks to a little better goaltending, a little more scoring depth and a little more playoff experience. Now, before you poo-poo my predictions, let me remind you . . . Vegas! But, by all means, feel free to post your own predictions in the comments below and we’ll see how it plays out at season’s end. Let the games begin!